Cubic zirconia (CZ) was found in 1892; however, CZ was rare and hard to find, so for a long time, it wasn’t sought after and was considered to have little economic importance. It was simply an oxide that existed naturally on our planet. In 1899, two German mineralogists discovered a different, naturally occurring form of CZ: microscopic grains. This was the point at which cubic zirconia began wider spread, but there was still only a limited amount of cubic zirconia for the ever-expanding market. Decades later, in the 1960s, studies began regarding how to grow cubic zirconia in controlled situations. The earliest studies were in France, where two scientists performed studies trying to achieve single-crystal growth of the mineral. Later, a team of Soviet scientists perfected the technique of growing single-crystal CZ in a controlled situation. This incredible breakthrough was published in the early 1970s, and the widespread production of CZ reached 10,000 kilograms by 1980. Now, when I say forced to crystallize I mean exactly that. 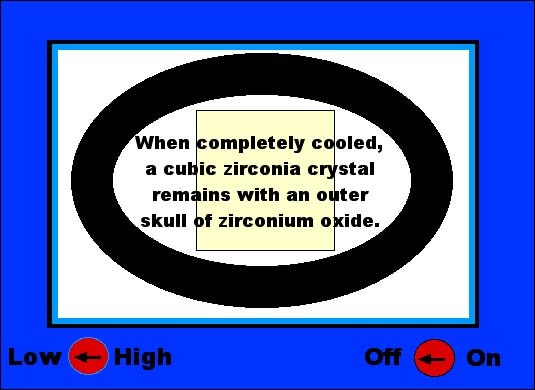 Zirconium metal with silicon (and in nature) will always form in the tetragonal crystal system. 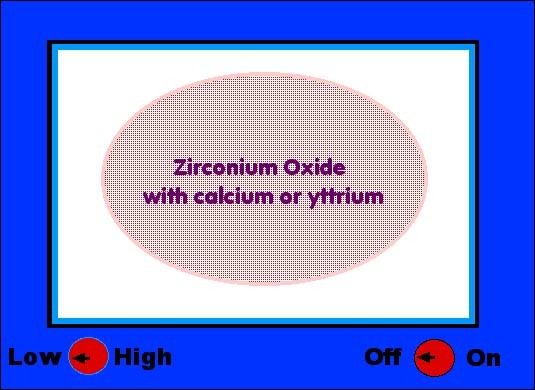 But by adding just a touch of either the elements calcium or yttrium, these elements have the ability to stabilize the zirconium metal to form crystals with the oxygen that have the properties of the cubic crystal system. The real importance of this fact is that diamonds are also cubic in crystal formation. So that any real imitation of diamond will have to also be cubic or they will never look quite right. As in the case of the synthetic moissanite. 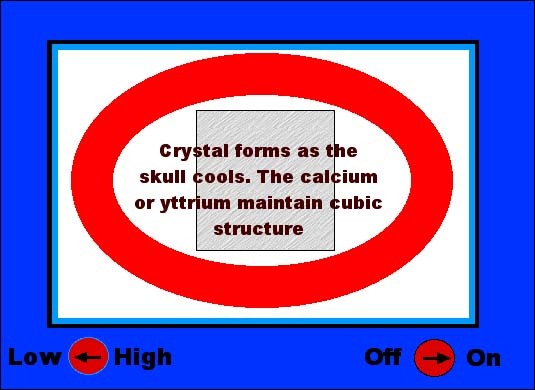 What the microwave did is to give a method of synthetic crystal growth called a skull melt. 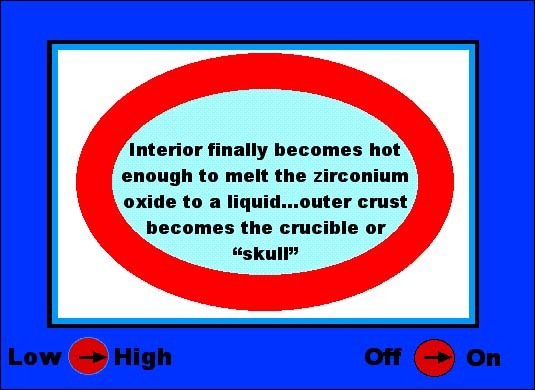 This means that the material itself makes its own crucible. 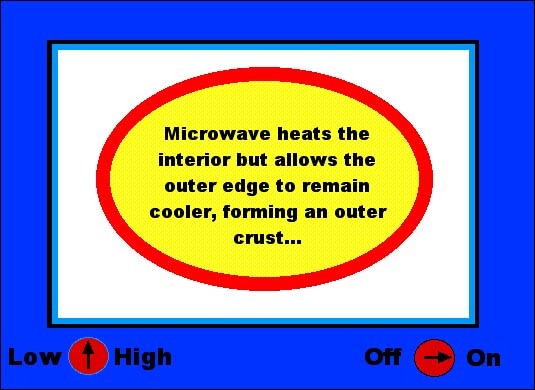 Since a microwave oven heats from the inside out, this allows for the interior of the substance to become very, very hot, while the outer layer stays cools and forms a crust that holds the molten interior. This is how the skullis formed and how we get the term skull melting. Imitates almost any colourless gemstone. Mostly used to imitate a diamond. Identification: Since it is over the reading ability of most refractometers, normal RI is not available unless you have a Jemeter or other reflectance meter. Most often identified by the rounding of facet junctions since CZ will never take the fine edge polish of a diamond at the facet junctions. Also, something called read through, where CZ will allow light to travel through at certain angles that diamonds will not. Most notable separation can be done using thermal conductivity meters which are widely used for ID purposes to separate diamond from CZ. These instruments are not recommended however, since synthetic moissanite will give false readings on these meters. And gemmologists who rely solely on the thermal meter will be open to problems with the synthetic moissanite stones. So a properly trained gemmologist will be able to identify CZ by its physical properties as the most accurate means. This will take experience and practice with known stones, hwoever, to master the ID process. A diamond expert is able to discern a loose diamond from a simulant just by eye alone, and is unconcerned with the following tests to separate the various impersonators, but we have included some of the differences for interest. Many jewellers use some of the tests for their own piece of mind, and no doubt you will already have seen a jeweller using one of the many diamond testers available on the market, the most common being the thermal tester. This is however unable to distinguish between diamond and Moissanite, and can catch the inexperienced appraiser. Diamond simulant has the same meaning as imitation and refers to any material that has the appearance of diamond but does not posess the characteristics, atomic structure, chemical composition or physical properties of natural diamond. Simulants commonly include Cubic Zirconia, Colour less Synthetic Corundum (sapphire), Synthetic Spinel, Strontium Titanate, Yttrium Aluminium Garnet (YAG), Gadolinium Gallium Garnet (GGG), and Glass (Paste). These are natural stones having the appearance of diamond. Stones include Sapphire, topaz, Beryl, Quartz, Zircon; all in their colourless forms. These are the manufactured stones that have no natural counterpart and include: Strontium Titanate, Yttrium Aluminate (YAG) and Cubic Zirconia. Glasses of differing densities, often referred to a paste. Stones were often constructed from more than one stone to enhance particular properties. Glass for example is very soft and to prevent the surface from scratching a layer of harder material was bonded to the surface. These stones are often referred to a doublets. 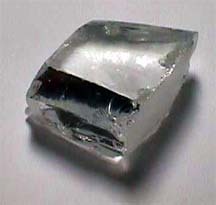 White Sapphire: Aluminium Oxide (alumina) Al2O3; crystal system: Trigonal; from the Indian Sanskrit Kuruvinda meaning hard stone; Hardness:9 ; Relative Density 3.99-4.05; cleavage: none; refractive Index 1.765-1.773; Birefringence: 0.008 ; Dispersion: Weak. This is often used as a diamond substitute in cheaper jewellery without intent to deceive. Usually found in round brilliant cut form surrounding larger coloured stones in rings. A refractometer test will immediately establish its identity if the table facets are unobstructed. Also sapphire is doubly refracting and will show four extinction positions when rotated between crossed polarized filters. Visually lacking in life compared to diamond. White Topaz: Hydrous Aluminium Fluorosilicate, AL2[(f,OH)2|SiO4] ; Crystal System: Orthorhombic; name derived from Sanskrit tapas meaning fire ; Relative Density: 3.49-3.57; Hardness:8; Cleavage: eminent along base; Lustre: vitreous; Refractive Index: 1.606-1.638; Birefringence:0.01; Dispersion: weak; Pleochroism:distinct. Occasionally found in jewellery eminating from the far East and easily distinguished again by refractometer. Visually there is much less brilliance and fire than diamond. 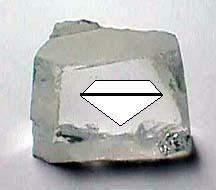 Doubly refracting, topaz is separated from diamond by rotating it between crossed nicols in a polariscope. White Zircon: Zirconium Silicate Zr[Si04]; crystal system: Trigonal; name derived from the Persian Zargun meaning golden; Relative Density: 4.6-4.7; Hardness: 7.5; Cleavage: Poor; Tenacity: Brittle; Refractive Index: 1.923-2.015; Birefringence 0.058; Dispersion:Strong; Pleochroism: Weak. This is a good simulant for diamond, it is hard has a high refractive index, and good dispersion. It is visually lacking in life by comparison to diamond, but has more than both Topaz and Sapphire. However it is easy to separate with an eye glass, having a large double refraction. Viewing a back facet through the table with a lens will reveal doubling of the edges. Zircon has a distinctive appearance which is easily recognisable once noticed. Synthetic Rutile: Introduced in 1948. Has a high degree of brilliance. Faint yellow colour, doubling of back facets caused by high double refraction (Birefringence: 0.287). High Relative density 4.25; Refractive Index: 2.62-2.90; Scratches easily, Hardness:6. This looks similar to a diamond of low colour grade. It has a high refractive index and a dispersion 6.5 times that of diamond which gives it an exceptional display of fire, and far too much to be diamond. Unlike diamond, Synthetic Rutile exhibits doubling of the back facets. Even with a bluish film added to the stone, some yellow body colour always remains. YAG: Yttroaluminate Y3Al5O12; (not related to garnet); Cubic symmetry; Relative Density: 4.57-6.69 heavy; Small Dispersion:0.028; Refractive Index: 1.83; Good Hardness:8.5; Grown by flux melt method and used widely in the early 1970's to be replaced later by Cubic Zirconia. This was first marketed in 1969, being made famous when Richard Burton had a copy of a 69 carat pear shaped diamond given to his wife, Elizabeth Taylor, made in YAG. It is quite hard, loups clean, and is singly refractive like diamond. It has less fire than diamond, but when cut with slightly different facet angles, starts to approach a good diamond look-a-like. These newly cut stones were marketed under the name 'Diamonaire'. It is relatively hard and holds a good polish with an adamantine lustre. It has a high relative density, and when weighed is clearly too heavy for an equivalent cut in diamond. A 1.00 carat stone measured on a Moe's gauge would weigh around 1.30cts on a balance. An immersion test in refractive liquids, will reveal its lower refractive index. Cubic Zirconia is an artificial synthetic because the stabilizing oxides used in its manufacture remain in the finished product and its structure is different to the natural material Baddeleyite Zr02. This has been such a good imitation that cubic zirconia can be purchased in both graded colours and clarities. Its refractive index is near enough for the stone to remain quite brilliant when tilted, and although the dispersion is higher than that of diamond, is not so obvious to the layman, and close enough to deceive. The relative density is much higher than diamond and a loose stone will appear to weigh too much. If set, it is easy to destructively test the stone with a diamond hardness pen. Moissanite is a new product but its origins go back to 1893 when Dr. Henri Moissan, a French chemist and later a Nobel Prize winner, identified minute quantities of natural silicon carbide, known as lusenite, in the Diablo Canyon meteorite found in a remote area of Arizona. Recently, these elements were replicated in a synthetic material to produce a synthetic gemstone with similar properties to diamond. The gemstone is more brilliant than diamond, Refractive Index 2.65-2.69, has a higher lustre than diamond at 20.4%, and a hardness of 9.25 , diamond being 10. Relative Density: 3.21. Because moissanite replicates a diamond so well, it could be sold as a diamond to the unwary buyer. Synthetic diamond is any manufactured product which has the same chemical composition, atomic structure, and physical properties as natural diamond. These are manufactured in the laboratory and are currently very rare in gem quality, but supplied in high volume as industrial diamonds for use in cutting tools and more recently as heat sinks for the semiconducter industry.